This pass week I spent some time driving around in the Jeep Compass. The model I reviewed came in all Black, with a Black Clear Coat exterior and Black rims. I haven’t been the biggest Jeep fan as the Grand Cherokee has been the only car from the brand that I would deem G Style worthy (although the Wrangler on some levels is acceptable). So would the Jeep Compass consist me of it style value after a week of use? Let’s dive in! The Jeep Compass from the pictures on their website don’t quite do it justice, which is why when I heard I would be reviewing one at first I was on the fence. But when you see it in person dressed in all Black and Black shoes on it, then you see it in another light. 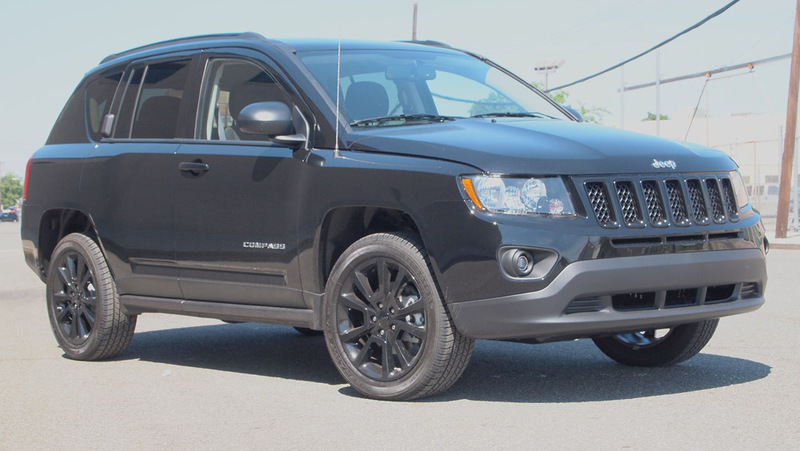 The Jeep Compass has good looks going for it, in a ruggedly handsome kind of way. The exterior looks like it can impress on the urban scene, and at the same time go off-road as well if it needed to. On the inside though, this is where that rugged part comes into play. The inside isn’t ugly, just isn’t quite elegant either. The interior lives up to the Jeep name, and looks like a vehicle that is meant to be on the dirty roads. The dashboard isn’t classy, stylish, or fashionable, it is made to be functional. It gets the job done, but don’t expect to much finesse. I wasn’t too thrilled with the tech inside the Jeep Compass. Most of the basics were there. At the heart of the Compass was the Uconnect 6.5 inch touch screen display with CD/DVD/MP3/HDD. There was no navigation or streaming Bluetooth music from my smartphone on this one. This is sad that, because that feature should be standard on ever car now a days. 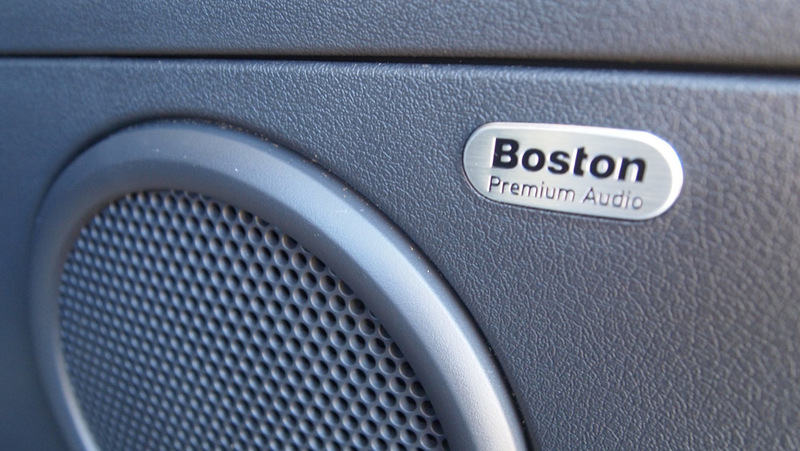 It also has 9 Boston Acoustic speakers with a subwoofer. The sound from these speakers through sounded good, I wasn’t able to get the “space-filling” loudness I wanted from them. Even when cranked up to 30-32 which was nearing max for the system, I was left wanting more. One thing I will give this Compass is that it had 2 articulating liftgate speakers. This is really cool especially if you want to take the music outside of the car say out in the woods or for a make shift block party. Some of the other cool features was a remote start system, SiriusXM radio, remote keyless entry (although now as cool as the passive entry on some other cars we have we reviewed). Driving the Jeep Compass was fun, with some minor negatives along the way. 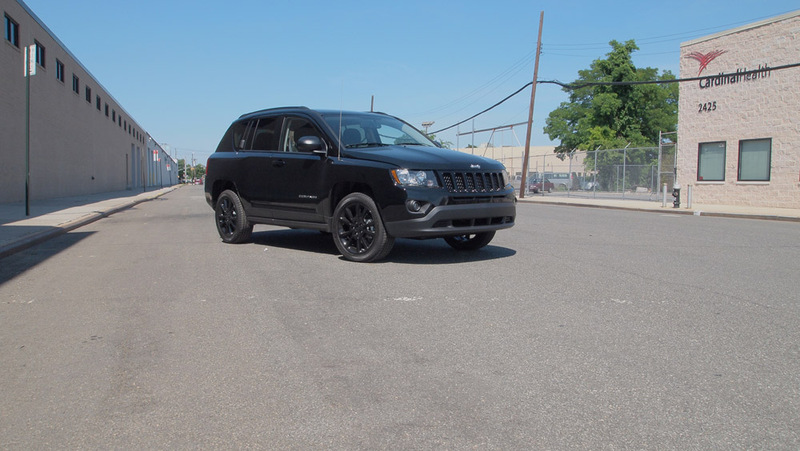 First off and not really the fault of the Jeep Compass but something you should think about if you ever decide to get an all Black everything car, is the heat! Oh man this last week, we had some temperatures in the 100s, and an all Black car sure does retain that heat. Be sure you use the remote starter and have the A/C knobs on full blast about 10 minutes or so before you get in or you will feel it. While we are on remotes, while the key does allow you to unlock the car, I just wish like some other cars the whole “touch the handle and the door unlocks” feature was standard on all cars. Once inside and move the ride is pleasant, no major complains with driving around in an all Black Jeep Compass is cool. The car looks good, and you feel good driving it. As far as pickup/acceleration, this was another minor hiccup. The pickup just wasn’t that cool for me. I could mash down on the pedal and the acceleration was a gradual up swing into speed. There was no power when I needed it. I like a car that is quick on getting up to speed. As noted in the tech section, there was no streaming music via Bluetooth from my smartphone on this model. They did have an AUX/IN plug, but that just lacks style or finesse. All in all the drive was functional, it got the job done. And while the it looks good on the outside while doing it, on the inside it could use a feature more comforts. 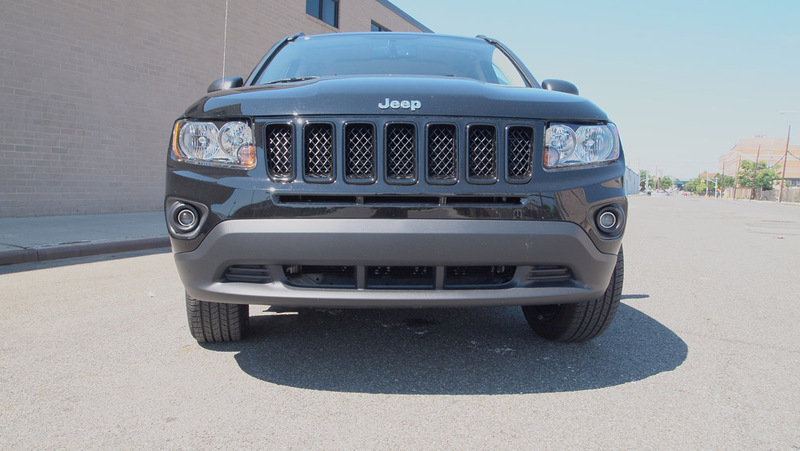 The base price for the Jeep Compass Altitude 4×4 model is $23,445 and with all the optional features included in this model we reviewed puts it at $27,000. It is a nice car to drive no mistakes there, and with it in all Black with the Black rims, it looks quite good as well. It does need a few more comforts that really should be standard in cars, but if your really to overlook those, this is a Jeep to own right there.